Join us on Saturday, September 16, 4:30-6:30 p.m. for the annual Sumunar picnic and meeting. 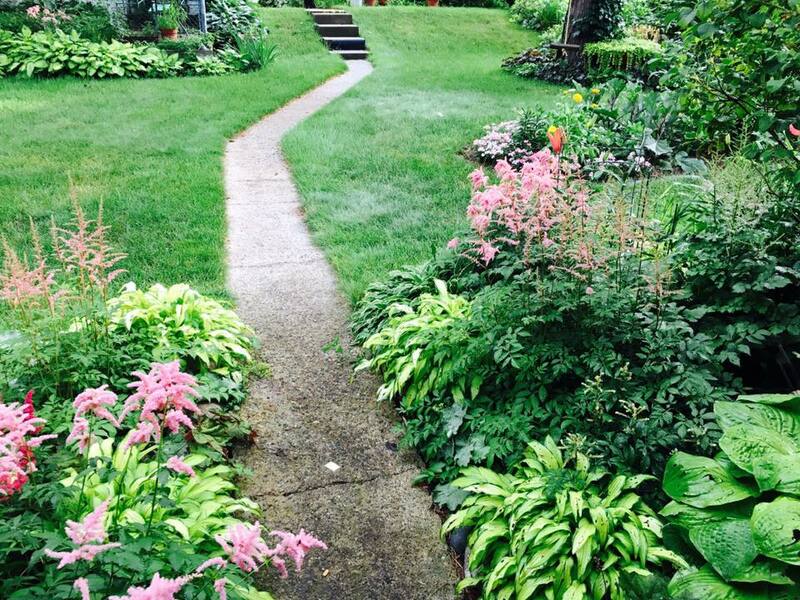 Bring a dish to share; we’ll provide barbecue and beverages. We’ll have games and socializing, as well as a short report on what Sumunar has been up to in the past year and some of our upcoming plans. We’ll also be voting for the new board of directors. To vote you must be a current member. 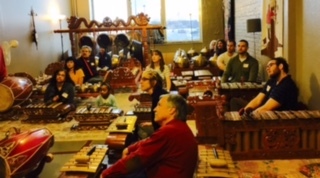 Membership is $35 annually and fully tax deductible. We’ll have membership forms available at the picnic. All are welcome! Please RSVP if you intend to come, so we know how much barbecue to make. 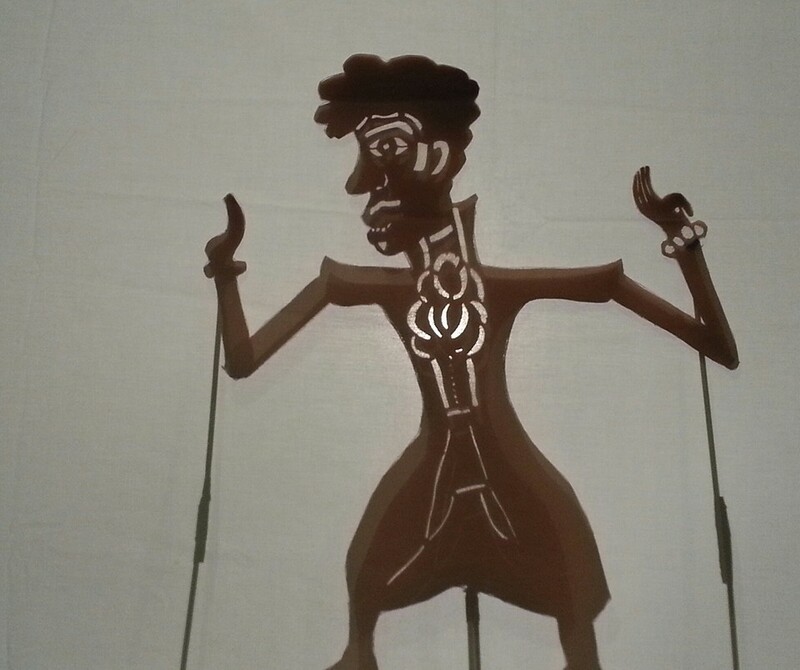 Join us for Shadow Visitors! 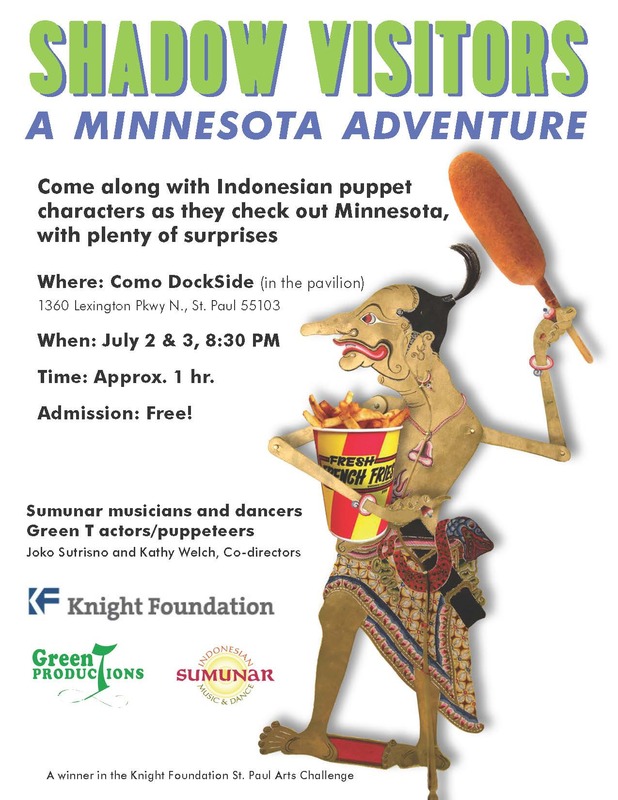 Directed by Joko Sutrisno and Kathy Welch; featuring Sumunar Gamelan and Dance Ensembles, and Green T actors/puppeteers. Shadow Visitors: A Minnesota Adventure, a collaborative work by Sumunar with Green T Productions, is featured at the Minnesota History Center’s Asia Pacific Heritage Day. 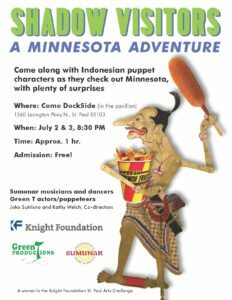 Join two Javanese princesses on their amazing journey to Minnesota, where they meet many Minnesota luminaries, including the Prince of Minnesota. Spectacular Surprise! 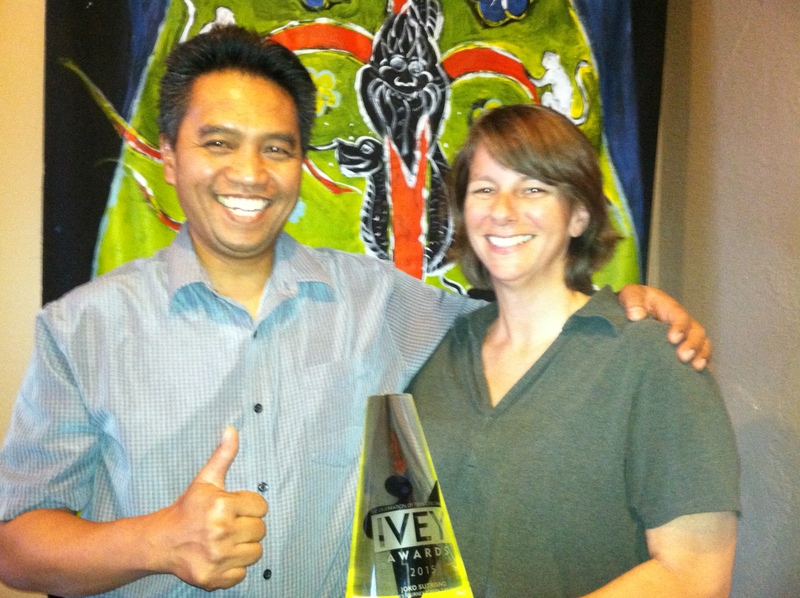 Sumunar Music Director Wins 2015 Ivey Award! On the evening of September 21, Joko and Tri Sutrisno attended the Ivey Award Ceremony at the State Theater in Minneapolis, thinking they were there to see Green T Productions be honored in some way. BUT NO—the award went to Joko Sutrisno (Sumunar music director) specifically, as music arranger/director for the show “Prince Rama’s Journey,” which played at Heart of the Beast Theatre in October/November 2014. It was a Green T Production with collaboration by Sumunar, so the honor was definitely to be shared. In this photo, Joko and Kathy Welch (Green T artistic director) display the Ivey Award received plus their own happy smiles. Congratulations!! The Ivey Awards ceremony began in 2004, with two primary objectives: 1) To celebrate and increase awareness of Twin Cities professional theater, and 2) to create a celebration for ALL people who love Twin Cities theater—those within the theater community and those in the audience. The non-nomination based awards recognize outstanding achievements within the past theater season in direction, performance, design, etc. The awards were founded by Scott Mayer and are administered by a panel of local theater professionals and theater patrons. 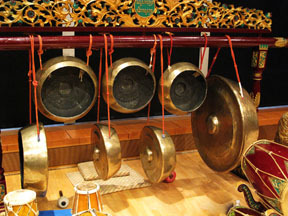 Sumunar, joined by guest violinist Stephanie Arado, performed music by Lou Harrison at a concert on February 24, 2013 at the MacPhail Center for Music. Harrison, who was a student of Arnold Schoenberg and a friend and collaborator with John Cage, Charles Ives, Alan Hovhaness, and Virgil Thomson, was at the forefront of experimental music in America in the 1930s and 40s. He built and maintained several sets of gamelan instruments for the colleges at which he taught during a long career, and he incorporated gamelan instruments, rhythm, and tuning in many of his compositions. 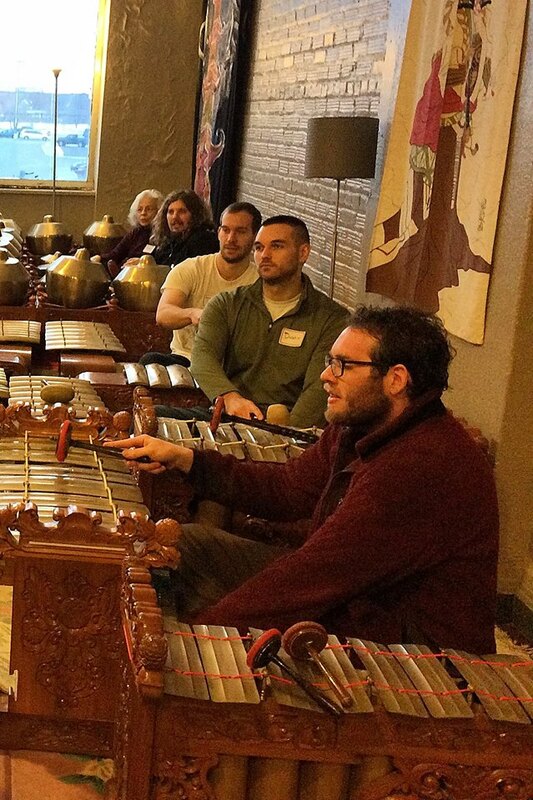 He’s considered by some to be the father of gamelan music in America. Here’s a lovely piece by Harrison based on Ovid’s tale “Philemon and Baukis” from our concert.